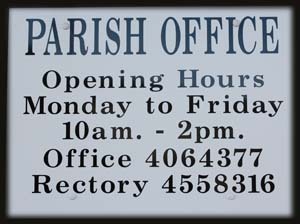 Our Parish Secretary is Lorraine Costelloe and she will be delighted to help you with any enquiry, booking a wedding, arranging a baptism, looking to join one of the groups in the parish or putting an Anniversary Mass in the book. If Lorraine is not available please do leave a message if you are contacting by phone. Each week within the mass leaflet is our bulletin. This keeps our Parishioners aware of what is happening within the parish. We are always anxious to be kept informed of those who are unwell and would like prayers offered for them. Any events or collections taking place within the calendar will appear here. If there is something you would like included please let Lorraine know by Wednesday to ensure it will appear in the following week’s bulletin.